About the expert: Anne M. Lipton, M.D., Ph.D. (@AnneLipton) is a behavioral neurologist who specializes in dementia. Her latest work on this subject is The Common Sense Guide to Dementia for Clinicians and Caregivers. She has also written an adult mystery and several picture books. 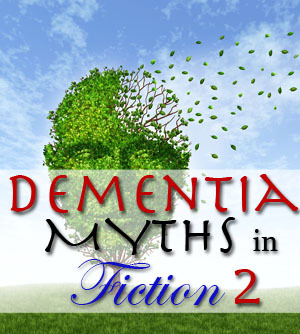 This second half of a two-part blogpost continues an exploration of common Myths about Dementia in Fiction. This post focuses mainly on evaluation and diagnosis of dementia. Of course, every fiction writer can build a novel brain, hatch new illnesses, or invent cool neuro-tech. But an understanding of dementia in our neck of the universe may help you more accurately portray this or a similar topic in the world you create. Myth #7: Dementia can be diagnosed quickly and easily. Dementia is a hard diagnosis to receive, a hard diagnosis to give, and often requires hard work to diagnose. An adequate evaluation for dementia can require painstaking time and effort, especially for those with milder symptoms and/or unusual features, such as age of onset < 65 years of age or behavioral problems early in the course of disease. No individual lab test or medical procedure (or combination thereof) is sufficient for a diagnosis of dementia. However, these may corroborate or exclude a diagnosis of dementia or help identify the specific type of dementia. 1) Medical History. History is usually gathered from a family member in addition to the patient being evaluated for dementia, who may not be able to provide necessary information due to memory loss, etc. The History of Present Illness (HPI) encompasses initial symptom/s (e.g. problems with memory, language, mood, or behavior), associated symptoms (e.g., problems with gait [walking]), onset (When did symptoms start? ), duration (length of symptoms), and disease course/progression (gradual, stairstep, rapid, or fluctuating). Medications, Past Medical History, and Social History (use of alcohol and other substances, sexual history, and education/occupation) may also be relevant. 2) Examination of the patient, including mental status (or cognition, such as memory, language, visuospatial skills, and executive functioning). The diagnosis may require up to a full day of neuropsychological testing (which includes thorough cognitive assessment). The history and examination may be enough to diagnose dementia and even the type of dementia based on certain clinical criteria/guidelines (see my previous post for a definition of dementia). Because dementia is a clinical diagnosis, it can’t diagnosed solely on a laboratory test, brain scan, lumbar puncture (LP or spinal tap), and/or other medical diagnostic procedure (at least with the currently available technology). If someone has a clinical diagnosis of dementia, laboratory tests of blood and urine may help either identify or rule out (exclude) reversible types of dementia (you can find examples of these in my previous Myths about Dementia post). Genetic testing is a major focus of dementia research, as our fearless leader Dan Koboldt can attest. Such testing may benefit certain patients, based on family history and other factors. Genetic testing may help hone in on a specific type of dementia. Current clinical guidelines recommend structural neuroimaging with Head CT (computed-tomography) or Brain MRI (Magnetic Resonance Imaging) as part of a medical evaluation for dementia. However, you can’t “see dementia” on a brain scan. You may see atrophy (brain shrinkage) and cerebrovascular disease (CVD = brain + blood vessel disease, such as leukoariaosis, also known as small-vessel white matter disease, or larger strokes). Atrophy and/or CVD are often associated in dementia and may help diagnose as specific type of dementia (e.g., certain patterns of atrophy suggest certain types of dementia and a significant amount of CVD may suggest a vascular dementia). But not always. Atrophy and/or CVD may occur in a person with no dementia, in which case these findings are said to be “non-specific” or “incidental.” We return to the idea that dementia is a clinical diagnosis: Look at the patient, not just the scan. You also can’t diagnose dementia by a brain scan alone. However, a brain scan may provide corroborating evidence for the diagnosis, exclude the diagnosis (e.g., if the scan uncovers a brain tumor or something else that may account for the patient’s symptoms), or help distinguish among the different types of dementia. Changes in brain metabolism on such functional scans, especially PET, may help in differentiating dementia types. But again, this expensive procedure isn’t always warranted for a diagnosis of dementia. PET does offer the closest thing to “seeing dementia” in a living person. Radioactively-labeled probes (radioligands) make visible some of the proteins that collect abnormally in the brain in dementia. Unfortunately, the medications to address these proteins are not ready for prime-time, so these scans are mainly done as part of ongoing research into these medications or in diagnosing difficult cases. In summary, no one really “sees dementia” on a brain scan, but the scan may show atrophy, vascular disease, or even abnormal protein collections that may point to a particular type of dementia. Scans may also identify or else “rule out” (exclude) problems such as a brain tumor. Dementia, including Alzheimer’s disease can be diagnosed during life. At least Possible Alzheimer’s disease and Probable Alzheimer’s disease. However, a diagnosis of Definite Alzheimer’s disease requires a brain autopsy (neuropathological evaluation). Early-onset dementia ≠ early-stage dementia. Early-onset dementia = dementia occurring in an individual < 65 years of age. Early-stage dementia = the initial stage (typically, a few years) of dementia, regardless of a person’s age. These two terms are not mutually exclusive (i.e., someone may have early-onset dementia and also be in the early-stage of dementia), but they do differ in meaning. What’s the most important test in diagnosing dementia? Trick question. Not a test. Generally speaking, the history is the most important factor in diagnosing dementia. In medical school, doctors are taught to listen carefully as “the patient gives the diagnosis.” Specialists who care for people with dementia and their families learn that “the family gives the diagnosis.” If you listen. Speaking of listening, I’m often asked what a person can do to prevent dementia. So, here’s my PSA: It may not be possible to avoid dementia if you live long enough (age is the major risk factor for dementia). However, you may be able to postpone cognitive decline by staying mentally, physically, and socially active. What’s good for the heart is good for the brain: Exercise has the best evidence for benefit. Also exercise moderation. Don’t smoke. (Few smokers get Alzheimer’s disease because they don’t live long enough to develop it, dying of other causes first. But they can develop vascular-related cognitive problems/dementia.) Eat your veggies. Floss. Live a full life. Hang out with your friends. Read. Write. Repeat. I hope that this two-part series helped to clear up some common myths about dementia that persist in fiction—and in life. Here’s to writing about dementia accurately in your fiction and to never having to experience it in real life.